On February 20, 2019 at approximately 1:52 am, officers from the Township of Hamilton Police Department responded to Cologne Ave, in the area of Oakcrest Drive, for the report of an erratic driver. Upon arrival, officers conducted a motor vehicle stop on the accused vehicle, and made contact with the driver, Mary Consalvo (64/F) of Mays Landing, who was operating a 2016 Toyota Camry. Upon making contact with the driver, officers observed a large clear bag of suspected marijuana inside of the vehicle (over 1 lb). Consalvo was taken into custody and transported to the station, without incident. 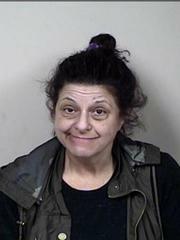 She was charged with possession of marijuana (4th degree), possession with the intent to distribute (3rd degree) and multiple motor vehicle summonses. She was released on a summons, pending court.